Trading with Heikin-Ashi Candlesticks, systems and strategies. A basic trend following trading strategy can be created around Heikin-Ashi candlestick charts. For more information on what Heikin-Ashi candlesticks are, see this article that explains them. Since Heikin-Ashi candles are used to reduce price noise and clearly display trends in the market, using the chart type to find and profit from trends can provide high probability setups during times when the market has a trending tendency. Any timeframe can be used, and this applies to nearly all markets. However, you must do your own due diligence by back/forward testing it yourself and only you are responsible for your trading activity. Heikin-Ashi charts or indicator within your platform. You'll find Heikin-Ashi quite common on most modern platform. Metatrader, Tradestation, and equity charting platforms like eSignal have it for sure. We'll start by applying a 50SMA to the chart. This moving average will serve to set the direction we trade. If the current Heikin-Ashi candlestick crosses up over the 50SMA, AND the current bar's open is higher than the previous bar's low (which suggests price is starting to move consistently up over the last two bars,) you'd take a long entry at the close of the current bar. You will keep trailing your stop til you've been stopped out, and if the trend is strong, you can ride out a very profitable trade using this method. 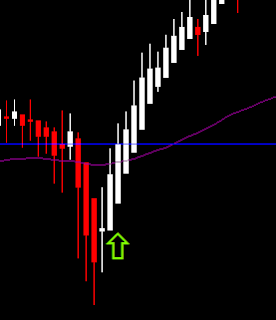 The green arrow shows the candle that crosses triggers our long signal by cleanly pushing through the 50SMA, and the blue line is the price level where you would have opened the position. If the current Heikin-Ashi candlestick crosses down under the 50SMA, AND the current bar's close is lower than the previous bar's high (which suggests price is starting to move consistently down over the last two bars,) you'd take a short entry at the close of the current bar. You will keep trailing your stop til you've been stopped out (hopefully in profit,) and if the trend is strong, you can ride out a very profitable trade using this method. Keep in mind, by trailing your stops to the high/low of the previous candle, you're tightening and reducing risk aggressively, often quickly locking in a trade 'in-profit'. In the short example image, you would have been stopped out near the top of the first white candle after the entry, that's a very precise method of keeping profits and knowing when to get out. Feel free to adapt this method and tweak it to your favourite market. That's it for now, happy trading! I experimented using Fibonacci ratios with the modified Heikin Ashi charts with reasonable success in identifying buy and sell triggers, even modified the standard technique. Would welcome your views on this. I'm quite new in this, but... do you mean that 50SMA should be set independently on the timeframe selected, i.e M15,H1,H4... should work with 50SMA the same way? Only one questions, whats your time frame that you working it ? Astonished that you say nothing about the direction/gradient of SMA 50 — immaterial? Copyright 2012 - WCI Marty Stevens --. Simple theme. Powered by Blogger.